Blog | Beautiful Baths | Remodeling Made Easy! Has Your Throne Lost Its Luster? There is a lot of attention devoted to what we call the wet area of the bathroom. This is the bathing area; whether it’s a bathtub, shower, or combination of both, we certainly spend lots of time talking about it. It’s an important part of any bathroom for sure, the world would smell a lot worse for the wear without them. But today we are looking at a bathroom fixture that changed the world as we know it. An innovation so game-changing that lack of access to it is still negatively impacting large portions of the developing world. This amazing development is, of course, the toilet. Yes, the source of so much grade school humour and so-called “impolite” conversation, has had a revolutionary impact on the modern world. The toilet as we know has only been in use since the late 19th century, but there have been countless iterations throughout all of human history, many of which are still in use the world over. This topic can make for an interesting read the next time you are in for a long sit (maybe you are there right now). But we won’t be diving into the messy history of toilets, sorry for the imagery, we are going to talk about your modern toilet. Specifically what to do when it isn’t feeling quite so modern anymore. Like any appliance or home fixture, no matter how current and chic it was at the time of purchase, give it twenty years and it will look more and more out of place as your home’s style and decor changes around it. This can start to cause reluctance to show off your home to guests and even cause you to hate going into the bathroom, something that just can’t be avoided (at least not for very long). 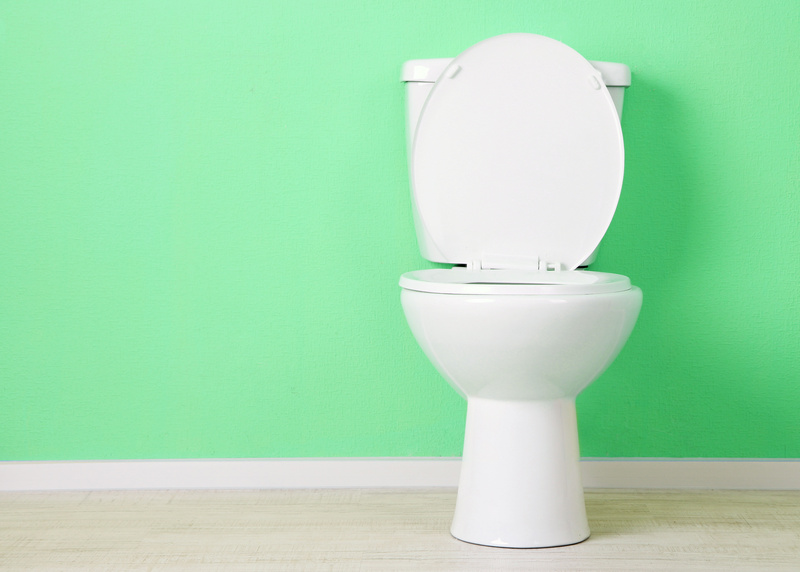 So when should you replace your old toilet? It may seem vain or superficial, but when you are dealing with something that you have to interact with daily, appearances matter. 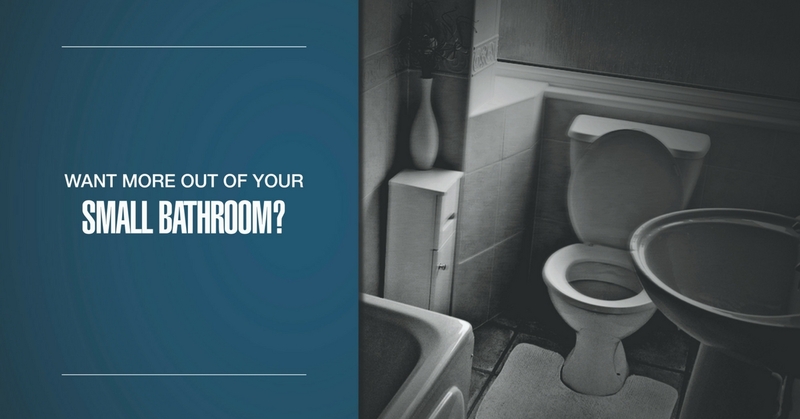 Having an old toilet that has persisted as the bathroom has changed around it can be an eyesore that can cause a level of stress every time you retreat into what should be a home’s sanctuary. Sometimes it’s the mint green porcelain that just hasn’t aged well into the 21st century, or maybe it’s the wooden seat and lid that you just never feel come quite as clean as you want. The surface of even the most beautiful toilet will become worn over years of regular scrubbing. This can lead to scuffing and staining that can cause it to never really look clean. Not to mention hard water stains that can leave nasty streaks through the bowl. Not the best look for your guests or yourself. Just hate the way your toilet looks? Any toilet can become clogged, whether through normal use or maybe a curious little mind wanted to see if a full roll of toilet paper could be sent spiralling down that mysterious hole. But if your toilet is aged and clogging more often that you would expect, that a big problem. A clogged toilet could be the result of a plumbing issue further along the journey from the toilet to the sewer or septic, but backups can happen closer to the source in an old toilet. Unless you like plunging and splashing, you may want to replace it. Does your old toilet clog constantly? Might be time to replace it. Older toilets weren’t made with water conservation in mind. Today we better understand the danger in needlessly wasting a precious resource so often taken for granted. 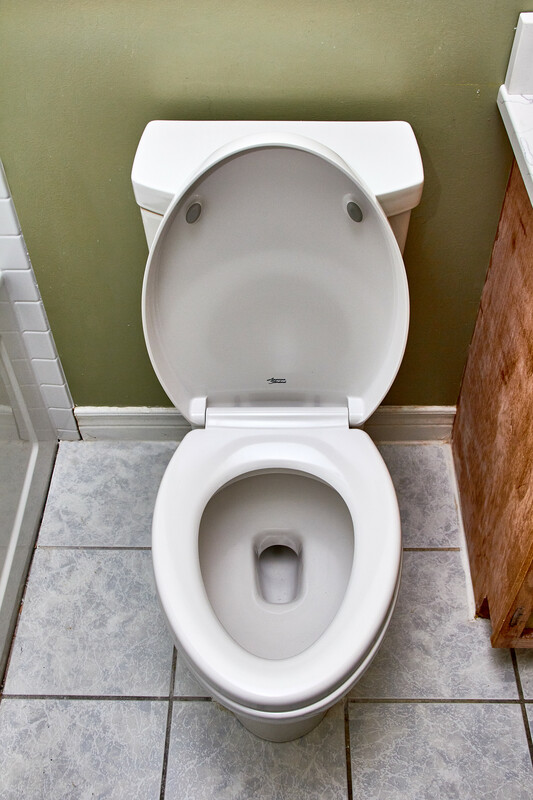 Today’s toilets use as little as half the amount of water per flush as their antiquated counterparts. Many come with the option of a dual flush handle. A lower flow flush for liquid waste and a higher flow flush for solid waste. Not only does this have a lasting benefit to our community’s infrastructure and the long-term conservation effort for future generations, it saves you money on your water bill. It’s a win-win situation. Old toilets use more water than needed. If your toilet is always in need of repairs; a broken chain, a loose seat, a torn flapper, then it might be worth your while to replace the whole thing and not have to worry about all the little pieces. Most concerning though is if you notice a crack in the porcelain. Even the smallest crack could be causing an unnoticed but damaging leak. And worse still, that tiny split could spread in an instant resulting in a sudden flood of hopefully unused toilet water. If you notice a crack of any kind it’s a good idea to replace your toilet as soon as you can. An old toilet that always need repairing might not be worth hanging on to. If you feel like your toilet is ready for retirement, and you would like to get a new one as part of your bathroom renovation give us a call or book an in-home or showroom appointment online. Some people tell us we’ve got potty mouths, I think they mean we can talk toilets all day. The alarm goes off. You lay bleary-eyed from another sleepless night staring into the darkness. No sunlight creeps through the curtains. It won’t rise for hours on this cold winter morning. You linger here, the blaring alarm seems distant as though it were only the last fading wisps of a dream. You know you should rise, but you are lost amid your own gnawing thoughts. Against all reason, you cannot bring yourself to leave the bed, not while it is so close. It is waiting just steps away, at the end of the hall, in the next room, maybe behind that closed door in your bedroom. Lurking just out of sight. Steeling yourself you rise, taking measured deliberate steps toward the source of your anxieties. You stop outside of the doorway, unable to yet cross the threshold. Bracing one hand on the door you draw a deep breathe as though submerging into endless depths. Pushing it open the familiar shadowed outlines come into view. You wish that you could go about this affair in darkness but you know too well that it cannot be. Flipping the switch, the full scope of horrors comes to life! Yellowed linoleum races toward your feet, threatening to crawl up your legs covering you with it's faded surface. The corners of aged wallpaper reach down in tattered wisps. The once bright floral pattern faded into the dusty hue of an unkempt lot of an abandoned home. The toilets furred lid sits open, gaping like the rust-streaked maw of some porcelain creature. But undeniable amidst all the rest, like a terrible crowning jewel from a darker age, the tub lies waiting for you. Its quarters are cramped and stifling. It’s colour a historical record, achievable without lead paint. Every surface mildewed and worn. Beckoning you forward you know you must obey. Sounds familiar? Might be time for a renovation. Rest easy my friends, this story does not have to suffer a bitter ending. There are options to make that old depressing bathroom beautiful again. If you are unhappy with your bathroom, and particularly with your tub or shower, you might be thinking that the quick and easy solution is to pop an acrylic liner over the old tub. Out of sight, out of mind. While there is no denying that this is an effective solution, you might be putting more out of mind than you know. 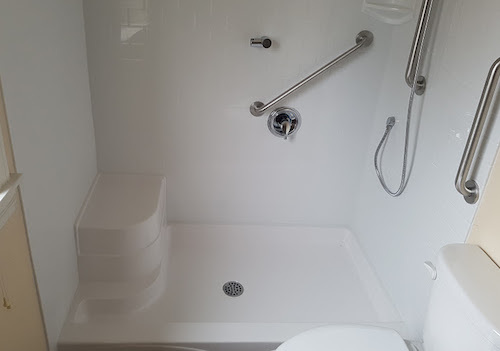 Acrylic liners are a suitable solution if you are satisfied with the size and depth of your current tub, as they are custom made to fit the dimensions of the existing tub. They will allow you to choose any colour and style but the aesthetic limitations are not the real cause for concern. If your bathroom looks anything like the one described above then it’s safe to assume your home wasn’t built yesterday, and in a older home you might be covering up more than an ugly tub with that liner. Acrylic liners provide a convenient solution to an ugly tub. But are they right for you? Like anything, plumbing does not last forever. Over the years, pipes can become blocked, seals will deteriorate, valves no longer hold under pressure. This is the unfortunate reality and all things in the home will require maintenance and repair on occasion. However, the plumbing in your bathroom is often not easily accessible, and should it require attention, consider yourself lucky if you can get away with an unsightly hole in your wall. Many times the entire tub will have to be removed to get at the troublesome area. This is not the idle scenario to face with torrents of water rushing out into the hallway. If you don’t want to reenact your favourite scene from The Shining then may we recommend that when you decide to update your bathroom, you opt to replace the old tub with a shiny new one. The cost is only a marginal difference and a full replacement can often be completed in one day. Not only will a new tub or shower offer you the full suite of choices for customization of style and sizing, but we will get to take a look at the structures underneath. 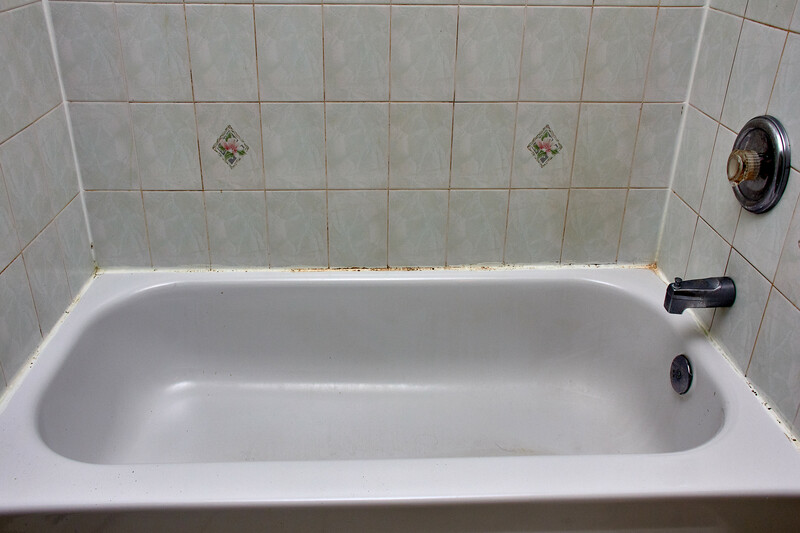 During a tub replacement we can inspect plumbing & the surround floor & walls for existing or potential issues. When we pull out an old tub you truly never know what you are going to find. Thankfully most times all is well. However just about anything could be waiting underneath. Rotten floorboards, corroded copper pipes, busted flanges, improper repairs from the previous owners just barely hanging on, it’s a grab bag of potential issues under there. But when we get to see underneath we know we aren’t going to find anything that we can’t handle. We know bathrooms floor to ceiling, so whatever the problem we’ve got the solution. With the old tub removed it’s the best time to check for issues that might arise down the road. No point in having a custom liner installed over a tub that falls through the floor a month later because you didn't know that over the years a small leak had rotted the floorboards. Don't get hit with an unexpected, costly repair. Catch problems before they happen. 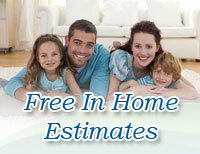 Book your free in-home assessment today!? If you are thinking about a new tub or shower please don’t hesitate to book an in-home assessment with us. It’s no cost to you and you won’t be pressured to buy. But you will get our expert opinion on the state of your bathroom. 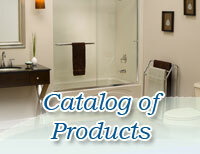 If you want to know more, grab a copy of the Bathroom Renovation Guide. It’s a free eBook that has everything you need to know about bathroom renovations before you get started. Let’s make your bath beautiful together. For a homeowner with mobility issues stepping over the side of a bathtub can pose a serious concern. The threat of slipping or falling while unbalanced is a real fear, especially if they are the only ones at home. Homeowners facing this situation generally no longer use their tub for baths. They may use an antiskid mat or stool inside the tub to provide more safety while washing. 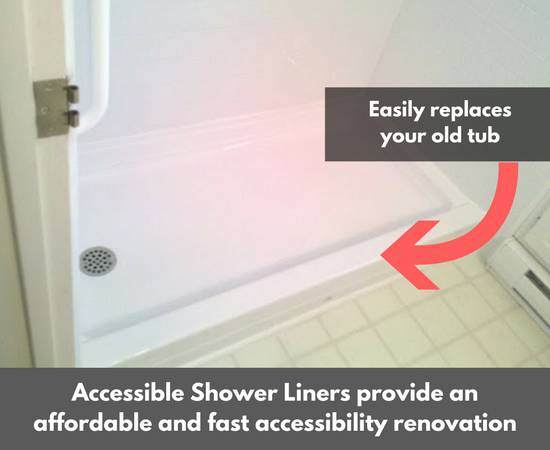 It’s becoming extremely popular for homes to renovate their shower and bath area to accommodate those with mobility issues. People suffering from mobility issues have an increased sense of security when they no longer need to step over an 18”-24” tub wall. 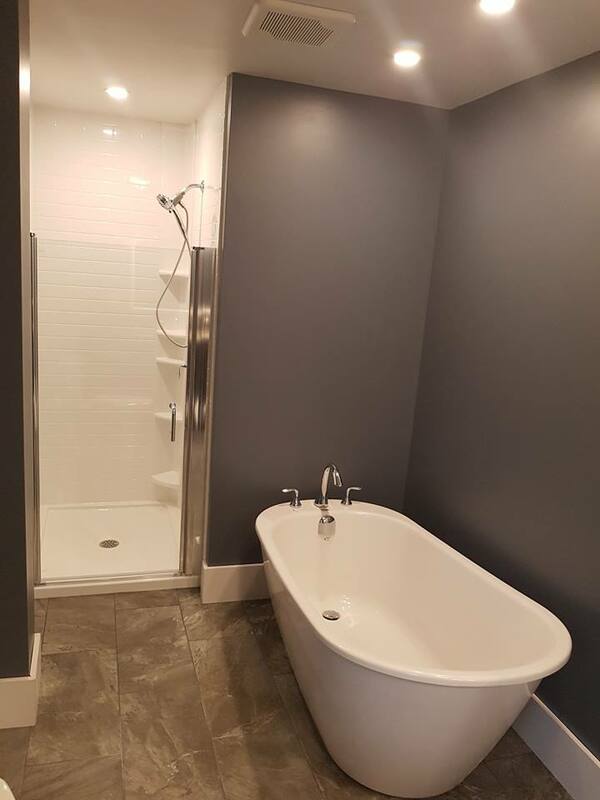 Nova Scotia Bathroom renovation specialist, Beautiful Baths, has seen a big spike in accessibility bathroom renovations in the past few years, and not just for the elderly. Many are for those that have mobility issues whether it be from injury, back troubles or arthritis. Most tubs in Nova Scotia homes are 5’ in length. 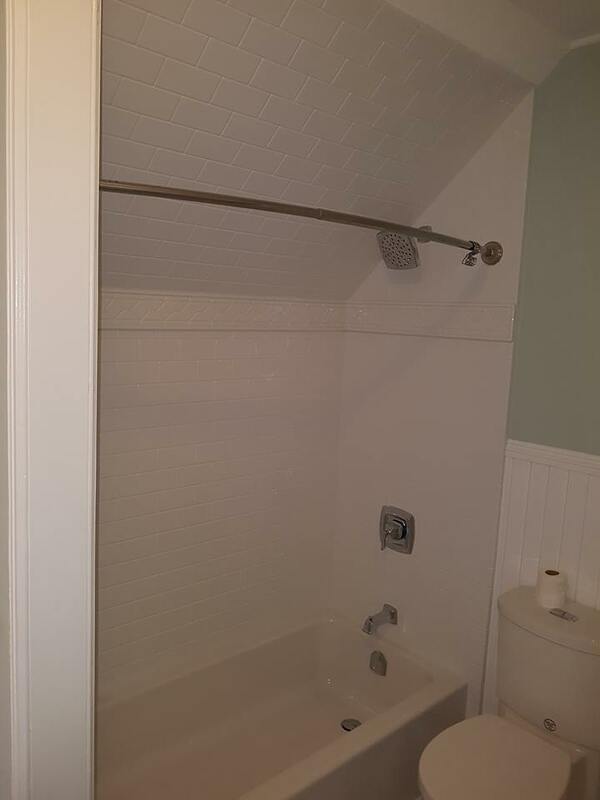 Removing the old tube and replacing it with a walk-in shower base is the most popular accessibility renovation. The barrier someone with mobility issues is required to get over and into the shower area can be as little as 1”. Far easier to get in and out of on your own when compared with a traditional bathtub. KEY TAKEAWAY: Swapping your old tub for an accessible shower fitting is a quick renovation to create an accessible shower area. The height of the barrier to get into and out of the shower can be as low as 1" or less. Grab bars and benches are popular additions for increased comfort and security. Grab bars are installed directly into the studs ensuring they are secure and can handle any accidental slips or falls that could occur. Handheld showers are a popular option as they can be used standing up or sitting down. While the home may be getting rid of the bathtub, it doesn’t have to give up on style. There are a variety of wall materials such as textured acrylic or ceramic tile to choose from, and the shower and faucet hardware can be selected to suit the style of the rest of the bathroom. Cost of an accessibility renovation ranges from $3500 and up. The cost is greatly determined by the materials you would like used when your old tub is removed and replaced. For example, acrylic walls take less time and are less expensive than ceramic tile. Beautiful Baths offers risk-free in-home consultations to explain your options and design a customized quote for the home. The time it takes to complete your renovation can be as little as just one day, even removing your old bathtub and walls. Complimentary In-Home Consultation and Estimate Beautiful Baths offers risk-free in-home consultations to explain your options and design a customized quote for your home. Give us a call today at 902-434-8088 or submit the form here to book a time. Here is a recent renovation we did of an ensuite bathroom. Our client's main concerns were the old dated bathtub and surround, the toilet that had succumbed to hard water stains, and the worn countertop and sink. This job took about a day and a half from tear out to clean up. This included a full replacement of the wet area and installation of new fixtures and counters. Let’s take a look at each of these areas and see how they looked before and after. The old bathtub and surround were functional, but left a certain something to be desired. The tub itself was in decent condition but was fairly shallow and not the relaxing sanctuary to melt away your troubles that it should be. Matching the substance without style found in the tub, are the faucet and handle. Both in full working order but lacking that visual appeal. The surround showed its age the most in the patterned tile with the unmistakable floral emblems. A remnant of the 1990’s and a stark reminder of the style atrocities that occurred at the end of the 20th century. Less charming is the mould growth on the grout and caulking, this is nearly inevitable in such a humid environment and difficult to remove once it has taken hold. 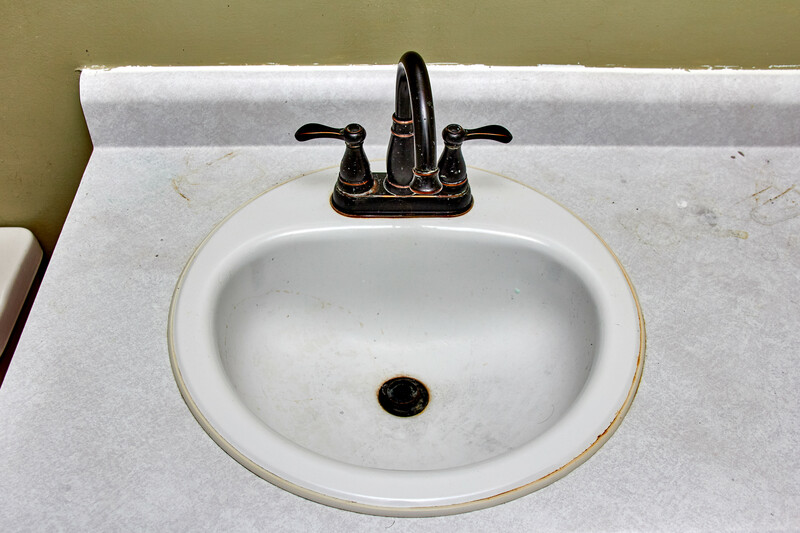 The existing sink and countertop were both suffering heavily from wear and discolouration. These are common issues that eventually befall laminate and porcelain alike. Here we can see mild rusting of the drain and the seal around the sink. We did find that the faucet assembly was a recent addition and was going to be to reinstalled in the new sink. The toilet was the biggest point of contention in the bathroom. It had suffered from years of hard water, resulting in the unsightly staining we can see here. 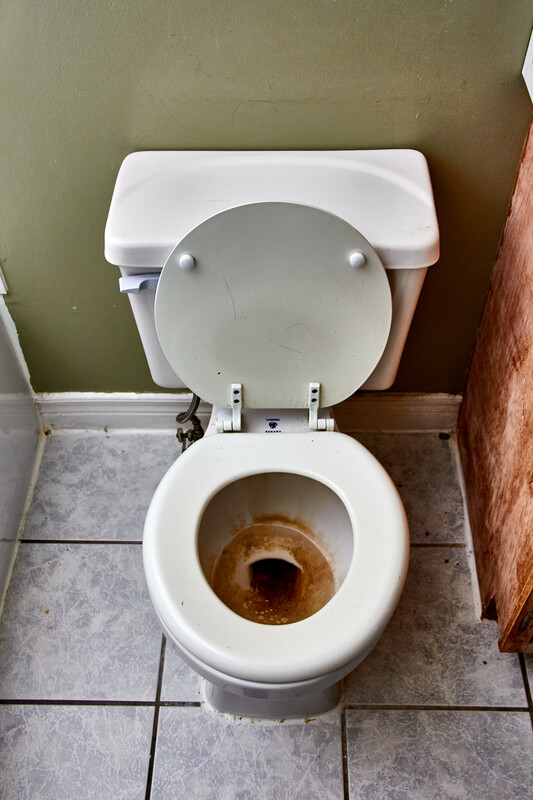 Once the inner surface of the toilet has degraded to this state, most times the only solution is replacement. You would be hard-pressed to know this was the same space had it not been laid out for you. With a complete replacement, we can see a stunning transformation of the tub and surround. The new bathtub is significantly deeper, with a slight slope to the back to allow you to sink fully into relaxation without sacrificing space. Also, you can see the ledges set in the sides of the tub that allow you to rest your arms without having to remove them from the water. The new surround benefits from a groutless acrylic surface that gives you the same clean appearance of white subway tile without the hassle and extended drying time that comes with installing ceramic tile. The built-in shelving gives you a place to store bath products that isn’t the ledge of the tub. An often overlooked benefit of this is that water can become trapped along the edge, creating an opportune spot for mould to grow. The new faucet is a lovely oiled bronze, the same as the existing sink faucet. Creating a sense of cohesion that pulls the overall feel of the bathroom together into a welcoming retreat rather than the utilitarian necessity it was. sink. In addition to creating a beautiful smooth appearance, this feature makes cleaning the countertop so easy. No more worrying about build up on the seal between the sink and countertop. A fresh new toilet is always a welcome addition to any bathroom, and this one is certainly no exception. Aside from the obvious bright, clean look this toilet totes a few extra features. The dual flush handle allows for water conservation, and the soft close lid prevents any chance of the lid or bowl becoming damaged from slamming shut. Most interestingly the lip and seat section attaches to the back of the bowl with a set of quick release clips that pop in and out easily for cleaning. 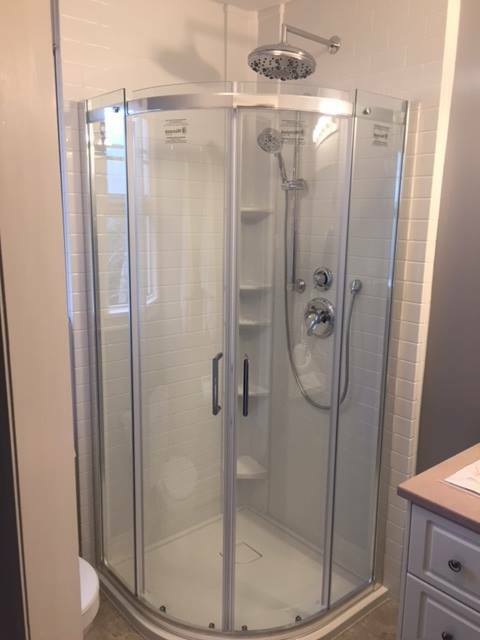 If you would like to see a transformation like this in your own bathroom, please book an in-home estimate so we can discuss what we can do for you. No matter what the current state of your bathroom is, or what your renovation budget might be we will work together to find a solution to make your bath beautiful again. How Much Does a Bathroom Renovation Project Cost in Halifax? If you are like most homeowners you probably have a lot of questions when it comes to bathroom renovations, and cost is likely at the forefront. Unfortunately there is no short, or easy answer. There is a multitude of factors that must be taken into consideration when you think about renovating your bathroom. Depending on what you feel needs updating or replacing in your bathroom, your costs could run from hundreds of dollars, up to several thousand. For instance, maybe you have a beautiful jacuzzi tub that you adore but the dusty rose colour just doesn’t match your modern subway tile backsplash. You don’t need to abandon it just yet, you could simply fit an acrylic liner over the existing tub giving you a fresh new feel with a modern look. Alternatively, you could breathe new life into that old tub through a process of refinishing the surface using a time proven method by Kott Koatings, free from any carcinogens or harmful chemicals. The cost of an acrylic liner and tub surround starts around $3,000 and increases depending on the style and design of walls and shelving you’d like installed. To refinish your current tub the cost starts around $600. Perhaps your entire bathroom is hanging on to the era of feathered hair, or bell-bottoms and you however, are ready for an updated look. We can replace tubs, toilets, faucets, vanities, anything and everything you need to update your bathroom’s style to match your own. 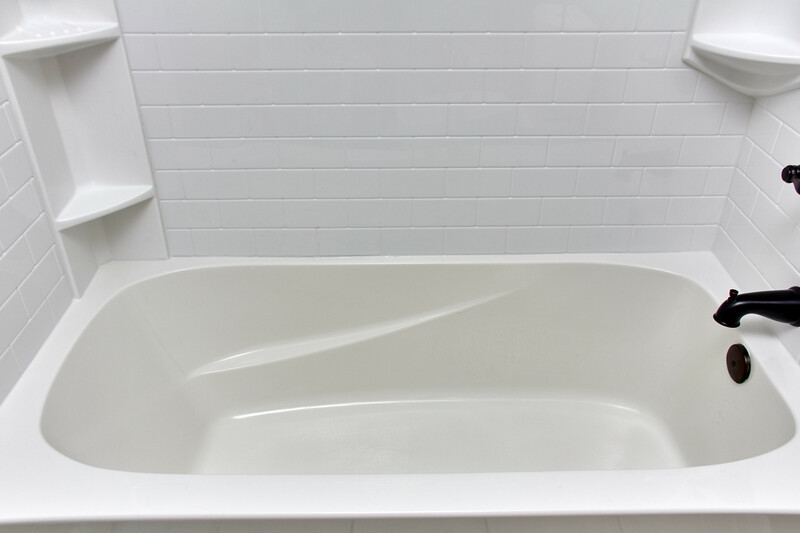 While both refinishing and acrylic liners save you time and money as opposed to replacement,tub and surround replacement is still the most popular option for our customers as it allows us to see exactly what is happening below the surface. When we install a new tub for you we remove the old tub and surround, including the old drywall, and drain assembly. This lets us see if there have been any leaks, or if there has been any other damage that will require our attention. This option provides you with the longest lasting results, and is the only option that is sure to address underlying issues. 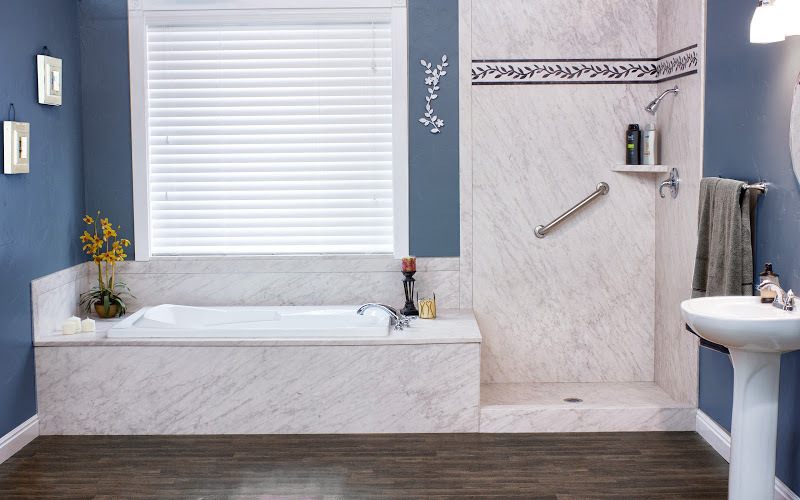 The cost to remove your old tub and surround then replace it with a new tub and surround starts around $3,000 and goes up depending on the style of tub, type of surround (acrylic, tile, stone) and any accessories you choose. When it comes to your bathroom, you have a lot to think about. Are you looking for a quiet sanctuary? Are you always on the go and just want a quick stop to freshen up? What’s your budget? Do you have small children, or anyone for whom accessibility would be a concern for in the home? These are all important questions to keep in mind when you are thinking about renovating your bathroom. At Beautiful Baths we specialise in bathrooms, and we’d love to discuss your options with you during a free in home estimate. To book now call the number above or submit the form on this page and we’ll arrange a time that works for you. Let’s make your bathroom beautiful again. 1. Larger Master suites : If you’re going to have all the items a luxury bathroom entails, you definitely need the space. Features such as a free standing tub, separate shower with recessed lighting , rainfall shower head, wall jets and a custom bench.Plus a beautiful custom vanity with dual sinks, stunning countertop, custom storage solutions, natural lighting , chandeliers and matching faucets are all important. 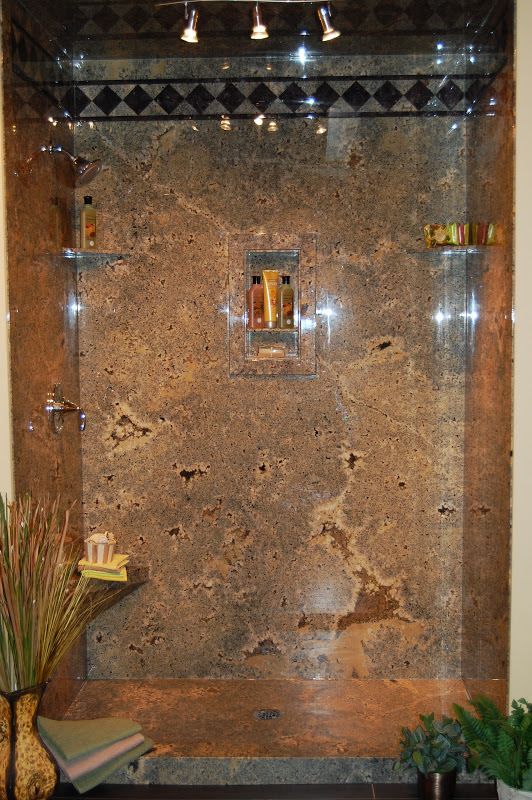 Many people want their bathrooms to be a place of peace and relaxation with luxurious surroundings. A large tub could potentially mean romantic baths or luxurious alone time to soak away the days stress. Two sinks can mean you and your partner each have your own space and can get ready at the same time. 2. 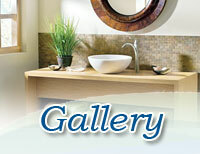 New porcelain tile : Harder than ceramic ,Porcelain tile is a popular choice for bathroom floors. Porcelain is easier to clean, a denser, more porous, harder option that offers greater stain and water resistance than ceramic tile. It also hold up to a lot of foot traffic so will last for years. Also, it’s suitable for radiant in-floor heat to keep feet toasty on cool mornings. Porcelain also offers unmatched design versatility. Tiles can mimic natural stone varieties, such as granite and limestone. 3. Walk in showers :A stand alone shower no longer means a glass door on a track. 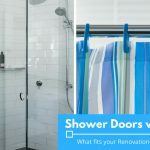 Now it means a frameless, doorless shower, sometimes called a wet room that can showcases tile work and can accommodate an elaborate, spa-like shower system.A lot more people are requesting European themed showers they can walk right into. Also a great option later on if mobility issues surface. 4. Infloor heating: For added luxury, installing in floor radiant heat keeps your bathroom warm and it feels wonderful on your feet on a cold am. 5. Multiple shower heads: This is the next best thing to actually being in the rainforest . Set into the ceiling, the 24-by-19-inch huge rain shower head drizzles and sprays like natural rainfall. Choose from a deluge spray that forms a curtain of water around you or a central spray that pours down and soaks you entirely and jets that spray water from the sides to massage your back. 6.Free standing bathtubs:Freestanding bathtubs are all the rage in home design right now.They are simply elegant and styling making them the focal point and centrepiece of a luxurious bathroom. 7.Custom vanities: Many discerning homeowners like to personalize their bathroom with specially designed custom bathroom cabinets. to both impress visitors and to walk into their space and feel relaxed . 8.Quartz counter tops: Quartz counter top surfaces are practical, durable and attractive. 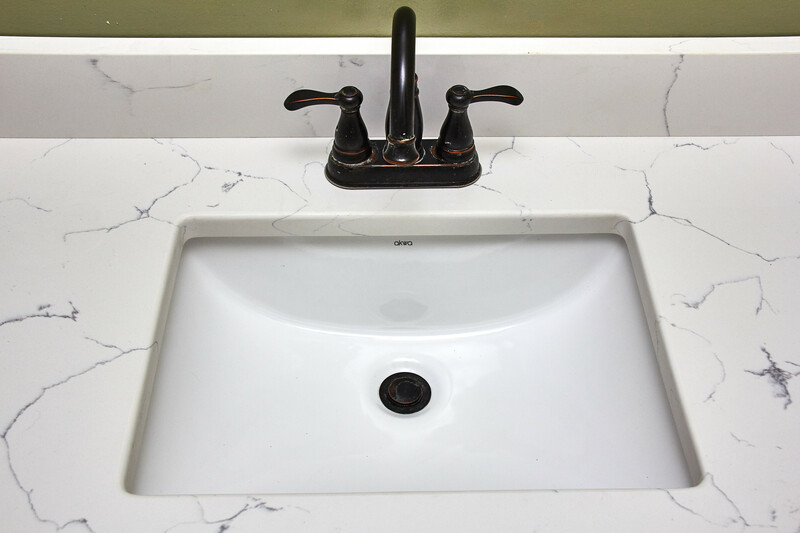 Quartz is perfect for a bathroom countertop or back splash. With its huge range of colours and finishes, Quartz gives you the freedom to create your perfect space. 9. Frameless hinged shower doors :The unique and sophisticated curved silhouette gives this door an attractive European flair. 10. Glass shower enclosures: A unique high end frameless shower enclosure will enhance the appearance of any bathroom and add to the beauty and value of your home.